The blockchain provides transparency, so users can safely interact with people they don’t know, while keeping their private information to themselves. Smart contracts make sure interactions go as planned, and generate marketplace specific reputation for successful deals. buy and sell products and services in a decentralized way. easily create and manage marketplaces for others to transact in. build communities of like-minded individuals to benefit from economies of scale. get rewarded for being a good actor by earning immutable reputation. Using Swarm City removes the need for third party intermediaries, and sets people free to communicate and transact without obstruction. Every human interaction has potential for conflict, and the less people know each other the more risk there is. That’s why centralized third party intermediaries like Amazon and Uber were created, because it’s not possible to personally know everyone you want to interact with. These third parties vouch for the people using their platforms, their reputation, so that users can transact without knowing each other. If users trust the platform they don’t have to trust each other. The problem is, in order to do that they built complicated infrastructures that end up costing users a lot of money. Uber charges 30% or more! And on top of that, users have to provide a ton of personal information. It’s only a matter of time until they get hacked, so ultimately how can you trust third parties with your identity? Swarm City removes the need for third party intermediaries, which brings down transaction costs and restores user privacy. How does Swarm City work? Swarm City has philosophical and technological components. Here are the conceptual pillars of each. Philosophy: In a nutshell, Swarm City makes it easy for people to use context specific marketplaces to transact in, or create their own. We call marketplaces “hashtags”. Users may also form decentralized communities to benefit from economies of scale, and earn reputation together through marketplace transactions. We call communities “hives”. In the physical world people find goods and services in physical marketplaces, like stores and shops. In Swarm City people find goods and services in hashtags. Hashtags are context specific marketplaces, for instance #needaride is a rideshare context where riders can find drivers willing to get them from one location to another. Or #contractor is where homeowners can find plumbers and electricians to fix their house. Users earn reputation by transacting in a hashtag. Not only that, Swarm City users are free to open and run their own marketplace by creating a hashtag. Just like a shop proprietor, the hashtag creator is responsible for making their marketplace an excellent place for business. They ensure that buyers and sellers, and service seekers and providers using their hashtag will have a great experience. They also handle any dispute that may arise in their hashtag. Go here to learn more about hashtags. Hives are people who share values and resources Each person has a unique combination of genetics and experience, and because of this their skillsets vary. For this reason it benefits humans to band together and form communities, to leverage the combined abilities and resources of all members. In Swarm City, these groups are called “hives”. Hives are people who share values and resources, and work together to provide services. For example, a group of aligned rideshare drivers may form a hive, and that hive would provide rides in a hashtag. Each driver would earn hive reputation for every ride they provide as a hive member, and would give a small percentage of their earnings to the hive’s shared resource pool. Drivers benefit from organizing this way because their hive reputation will give them influence on how the resource pool will be spent; for example, pooled insurance and marketing. Go here to learn more about hives. Reputation shows what a user values. 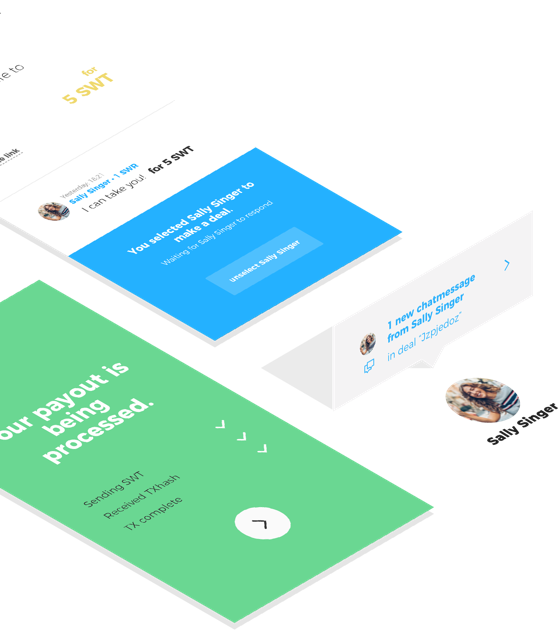 Often in-person commerce is transparent because both parties can see the goods and payment method that make up the deal. But sometimes people transact without knowing each other, either in person or online. In those situations people need some way to establish trust, so they may have confidence that the person they’re dealing with and the transaction itself is above board. 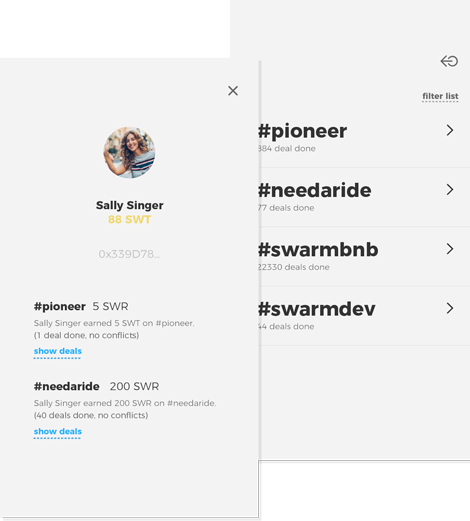 In Swarm City users create contextual reputation by completing transactions in a marketplace (hashtag). As an example, riders and drivers who successfully complete a #needaride transaction both get #needaride reputation. Users gain reputation in each marketplace they transact, and that reputation is forever associated with their profile. Their reputation gets affixed to the blockchain, which means it’s permanent and absolute. A user’s profile will show all the reputation they have acquired in hashtags and hives, and because of this, gives their transaction partners a general understanding of what types of things they value, and what types of things they’ve achieved competency in. Go here to learn more about reputation. The Swarm City protocol is built using Ethereum. Ethereum is an open source, blockchain based technology that enables developers to create and deploy decentralized applications. The core elements of Ethereum are a public ledger (blockchain), and smart contracts. Go here to learn more about Ethereum. A blockchain is a distributed public ledger. It is a continuously growing list of transactions which are cryptographically linked. Blockchains are important because they prove, with 100% certainty, that an exchange of value happened. Go here to learn more about blockchains. Smart contracts are programs that facilitate exchange on a blockchain. When certain conditions are met, a smart contract automatically executes, and because they run on a blockchain they operate exactly as programmed without any possibility of censorship or fraud. Go here to learn more about smart contracts. Projects built on the Ethereum platform use their own token. In Swarm City the Swarm City Token (SWT) is what we use to bind our ecosystem together. By using our own token, the value created in Swarm City gets reflected in the value of SWT. Are you a developer who wishes to help build Swarm City? Join Dev in Riot here. Won’t you join our open source community? Request a Slack invite here. The Swarm City Timeline is divided into five major releases. Swarm City Terminal was released on February 18, 2017. You may read the release article here. The first thing a user must do is establish their identity. In Swarm City, a user’s identity is their public/private keypair, also known as their wallet. The Terminal release gave users the ability to create their own wallet, send and receive Swarm City Tokens (SWT), and exchange Arcade City Tokens (ARC) for SWT at a 1:1 ratio. Boardwalk and the first marketplace called #pioneer was released on June 15, 2017. You may read about Boardwalk here. Once a user has their identity, they may then interact with other users. In Swarm City, users find each other and transact in marketplaces on Boardwalk. Successful transactions in Swarm City marketplaces generate context specific reputation. Users may also create their own marketplaces for people to transact in. You may read about V2 here. V1 proved decentralized commerce is possible using Ethereum smart contracts and blockchain. It also served as a learning tool for Swarm City devs, as they were able to solicit and apply feedback. Boardwalk V2 is a refined experience with new capabilities including: deal cancel, conflict resolution, and marketplace creation. You may read about Storefront here. In Swarm City, a Storefront is a graphical user interface (GUI) that makes it easier for users to interact in a marketplace. Marketplace owners will choose a Storefront that best fits the needs of their marketplace users. For instance, a rideshare marketplace would benefit from an interactive map, so the marketplace owner might choose a Storefront that includes one. You may read about Hives here. Hives are decentralized communities of individuals who share values, and benefit from economies of scale. 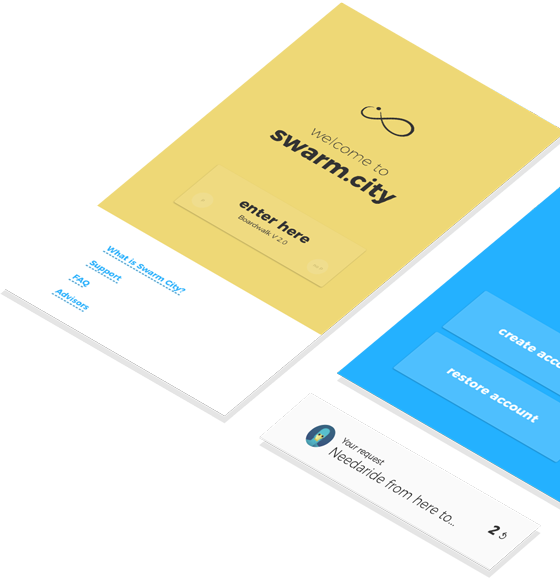 In Swarm City, users will be able to create and join Hives, decide on community governance, and share resources and reputation.